There is something to be said for simplicity. When it comes to food we enjoy in our house, it doesn’t get more basic than a bowl of white rice with some flavorful add-ins. Not only is rice the most widely consumed staple food in the world, it goes well with just about anything. Keeping it real folks, but sometimes I’ve served up rice and gravy when I don’t have time to run to the store to make my Southern Mashed Potatoes. Now, its not like my family didn’t know the difference, because trust me–mashed potatoes are gold around here–but rice worked as a quick stand in. My kids LOVE it when we cook anything with and Asian flare, be it Chinese, Japanese, or even a Vietnamese Noodle Soup or some yummy Thai curry. For them, these types of food and chopsticks go hand in hand. We have bamboo chopsticks in the kitchen drawer all the time because of this. Although, I must say–our daughter has been know to eat macaroni and cheese with chopsticks from time to time as well. Chopsticks are such a fun way to introduce children to new cultures. When our kids were smaller, we loved these children’s chopsticks that basically teach kids how to hold and use chopsticks. It’s all about taking the time to make conversations and letting them ask questions. If you don’t know the answers, take to the internet and look them up together! Life is about learning. Rice bowls are such easy recipes to throw together. Some people won’t even need a recipe to create a rice bowl that is out of this world delicious, but–if you do need one–we’re here to help. You might also enjoy our Cantonese Noodle recipe or our Chicken Fried Rice–which is gluten-free and SO utterly amazing. Fry the meat in oil and honey, in a skillet over medium heat for 2 minutes each side. 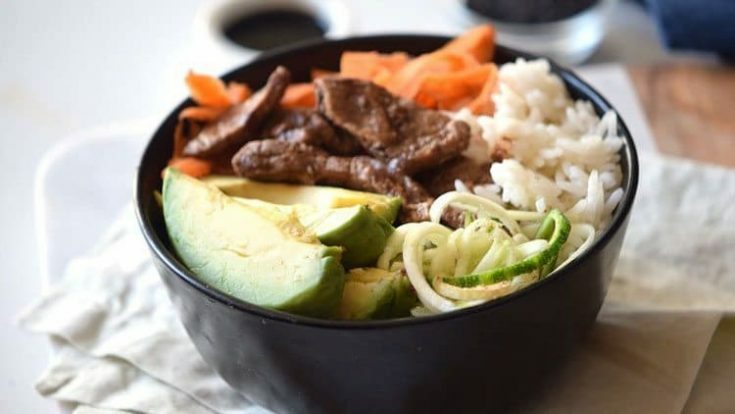 Place the rice, carrots, avocado, and cucumber in a bowl. Before cooking the meat, make sure it is almost at room temperature, so it becomes tender. No matter what you toss in, a bowl full of rice, veggies and some flavorful meat is going to be good.